Here is the story of the discovery of Dahl Surprise and the first explorations of this wonderful cave. The beauty and variety of the cave's formations amazed all of us and the complexities of its endless passages got us lost again and again. Over 600 meters of the cave were mapped, but much more needs to be done. Unfortunately, vandals eventually found the cave and destroyed or stole many formations. We asked the Saudi government to put a gate on this cave around the year 2001. We are still waiting (in 2009) for the bureaucracy to take action. May 5, 1999. We were back in the desert and Spring was in the air, even though the temperature of that air was 105 degrees F (42 C). Lars Bjurström was driving Susy and me to a cave he had found only a few weeks earlier. As we drove out of the little town of Shawiah -- which is almost completely surrounded by sand dunes, Lars showed us what a 4WD can do once the tire pressure is reduced to 15 pounds. We were amazed to see him plow into extremely soft sand, stop on an upgrade and then crawl right out. We had heard of using this technique to get unstuck, but Lars left the pressure low all the time we were off asphalt with no problems and could easily drive under the worst of all conditions. As soon as we passed Shawiah, we saw Dhubbs galore scurrying hither and yon. 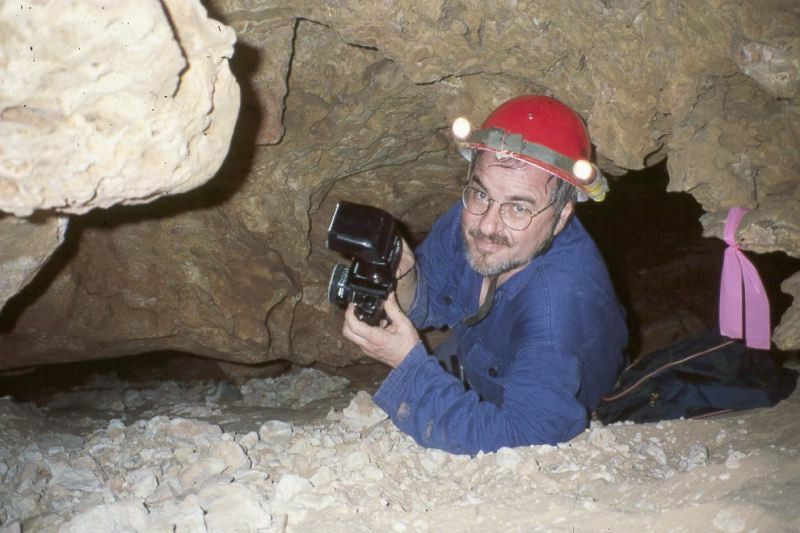 Before we arrived at Surprise, Lars showed us a small collapse which revealed several very old-looking stalagmites whose tops are only two feet below the surface level, obviously the floor of a cave long ago eroded away. "And now, where is the entrance to Surprise?" asked Lars. Well, we wandered all about looking for it, but you definitely can't see that small hole from over a meter away. Early Thursday morning I went to the cave area, planning to meet Lennart on Friday. Lennart seems very interested and as crazy as me. It was a very disappointing Thursday. I think I went down 12-15 holes, most of them nothing. And nowadays I don't give up easily. In the afternoon I was dead tired, bruised and with aching knees. I found one rather big one but "hostile." By that I mean lots of tight passages, sharp and difficult floor, gray, dusty, dull and with no decorations whatsoever. You can see it is dead. At that time I was ready to give up caving altogether. A sheep herder I met at a hole said: (in Arabic but I got the meaning) "Don't go down there. There is nothing to see and it is dangerous. You are crazy!" And he shook his head. I almost agreed with him, but I went down. When I came back up, after rather a long time, he was still waiting for me and I could clearly see he was surprised I was still alive. I also saw my first snake, a small one that quickly disappeared. On the way to my camp in the sand dunes I found one interesting hole close to Friendly Cave but I decided to check it the next day with Lennart. I had a nice, peaceful evening by myself in the sand dunes testing my new car tent which is fixed to my new roof rack and which I can roll out to make almost a bedouin tent. It worked fine. The sand was very firm after heavy rain and it was really funny to drive up the highest hills with no difficulty. Beautiful evening. The next day I met Lennart at Friendly Cave. We had some difficulties to find the cave he had told me about and I stopped at a small hole, not much bigger than Dahl Sultan, to have a quick peak. I could chimney-climb down approx. 7-8 meters and to my happy surprise (to say the least) a nice, beautiful, cave presented itself! It was clean, big (I could walk upright), nice, sandy, floor and with lots of really beautiful decorations. So I named it Dahl Surprise. I walked as long as I dared but soon went back to get Lennart. We brought all the marking line we had and started to explore it. And it went on and on until we had no more line and did not dare to go further. We were also very tired. But it is a major cave, that's for sure. And friendly! No dead sheep, no really tight passages (except at the entrance) and very beautiful. Also, the temperature is relatively cool . It was lots of "My God!," "Sh--! "and "Wow!" Not to mention "It continues further!" or "You have to see this, Lennart!" We stayed for three hours and some very delightful hours they were. All my troubles from before vanished with the wind. Now I have to go back there with my camera and lighting gear and more marking line, so we can go further. It is much bigger than Mossy Cave and with lots more decorations than both Mossy and Friendly Cave. It has several interesting branches that need to be explored. There are no signs of any previous visits. 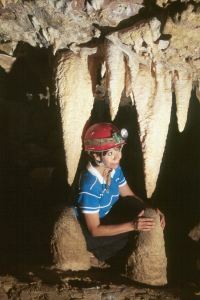 It showed signs of really heavy flooding since some of the flowstones and stalactites were ripped off. The stalactites look virgin, white and clean with water still dripping from them. The flowstone is, at some spots, just marvelous. I really needed and deserved this, I tell you. On my way home it was a very happy Lars, playing the stereo full blast and thinking of all those people back home who don't know how to live! Dahl Surprise here I come! We threw a handline down the hole and clambered about 15 meters to the bottom, which doesn't look promising at all: a lot of dusty breakdown (thus the name of the cave). Beyond this area, its a horizontal cave with lots of walking passages and several big rooms. The floor is frequently sandy with signs of water movement in recent times and the temperature in most parts of it is cooler than Sultan and Mossy but not as chilly as in Murubbeh. Resisting the nearly irresistible temptation to run off to the beauty spots of this cave, we began surveying it right from the surface. The cave starts out looking a lot like Sultan with thick, weirdly shaped tentacles reaching forth from the ceiling and side walls. But even this part of the cave held hints of things to come. Tucked away in a little alcove was a collection of long, thin, gypsum needles, mostly straight, with one oddball describing a funny, gravity-defying curve. After a while, we reached the Feathered Column, covered with what may be tiny relatives of the snowy feathers of Murubbeh. Just next to it are some stalactites that are "wrapped" with what looks like a layer of translucent glass, plastic or bubble-wrap. For some reason, this thick coating stops right at the bottom of the stalactite. Looking straight up from below them, you can see that the outer layer is completely separate from the older formation underneath. Here's a phenomenon none of us have seen before... but we seem to be saying this with every new cave discovered in Saudi Arabia! By now, we were hungry, so we headed for the surface and drove off to a great camping spot hidden among some nearby dunes and accessible only to vehicles with nearly flat tires. Along the way, we saw quite a few frolicking gerboas and in the night we found an unusually large number of insects fluttering around Lars' Coleman lamp. One of these vaguely resembles a small dragonfly, with wide, transparent wings. With Dhubbs a-running, gerboas a-jumping and bugs a-fluttering, we speculated that the bats we haven't seen for so many months might also be back in residence. Next morning we spotted an odd-looking lizard running along the big dune next to us. It had shiny, silvery skin and when we came near, it dove straight down into the sand and vanished. We dug down and found no trace of this creature which we later learned is known as a sand fish. We drove off to the cave around 8:30 AM, an ideal time for dhubb watching. Actually, it was the dhubbs who were watching us while they were "warming up" next to their holes and they would allow us to get surprisingly close before diving out of sight. Back in Surprise Cave, we surveyed our way to the Crystal Room. Here we saw some very curious small white formations which seem to be composed of discrete segments invisibly joined together, almost like three-dimensional mosaics. the most striking of all looked something like a scorpion's tail. At the far end of this room there's a wonderful set of stalactites and stalagmites framing a "window" that Lars named The Dragon's Mouth. A great many formations in this room were dripping water even though there had been little rain this year. The Crystal Room has three big passages leaving it. As we began to survey one of them, a real tragedy occurred. Pulling the survey tape taught caused it to whip over to a new position, snapping off the Scorpion's Tail. It's impossible to describe how badly we felt about this. Because such a thing had never happened to us before, we hadn't realized how easily a measuring tape could be an implement of destruction in a delicate environment. The Scorpion's Tail broke off intact and we hope we can glue it back in place. (Lars Bjurström succeeded in doing this a few weeks later). With much greater care, we continued surveying until we came to ... JAWS! This is a set of two fang-like stalactites right above two stalagmites and they really look menacing. Next we came to a rather muddy area where there are two big stalactite displays that long ago cracked off and fell to the ground. One of these, which must way tons, we called Fallen Glory. These huge chunks-- plus many notable cracks throughout the cave -- seem to suggest there was a mighty tremor in this area long, long ago. At last we arrived at Perseverance Payoff, a passage Lars had figured went nowhere but which Arlene Foss later followed back to what is to date the most amazing set of formations in this cave. The Chandelier is a number of stalactites which have been completely covered by the glass-like, nearly transparent coating mentioned earlier. But in this case, the bottoms of the stalactites are sealed. Then comes what is really weird: the tips of the stalactites don't come to a point, but instead to a "ducktail" which is thin and flat and -- get this -- is angled at about 45 degrees instead of pointing straight down! In one case, the stalactite ends in a set of two ducktails which resemble the separated leaves inside a Leyden Jar. A whole day had passed. We packed up and drove back to our campsite, stopping to watch two gerboas (which look like kangaroo rats to me) playing hide and seek under a bush illuminated by the car's headlights. They didn't seem to mind our presence at all. Back at camp, we found Arlene and Lennart waiting for us and spent the evening chatting around a campfire. The temperature couldn't have been nicer and the sky was filled with brilliant stars. Just before bedtime, Susy heard a scratching sound under Lars' bedroll. We lifted up the blanket and found a baby gerboa wandering about, which it kept doing even in the beams of our flashlights. Finally, it scurried off to the underbrush and performed a series of amazing jumps straight into the air. The following morning our old friend the sand fish reappeared at about 8:00 AM. We soon learned you can walk up to them slowly and, after they "dive," just wait a bit for them to reappear. Lennart and Arlene took off for Surprise Cave and we tried once again (without luck) to find Dahl Hashami. Next, we went to Murubbeh to photograph the large, neatly folded animal skin "blanket" we found there. Bones in the cave are about 1000 years old and this skin may be of the same age. In the cave we found a lot of bats (Trident) which had not been there during the winter. This inspired us to go check Thousand Wings, but no bats there. 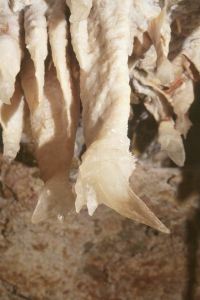 Next, we went to Guano Cave, which had some bats that appear to be insectivorous but don't look like Tridents. A baby rock dove was sitting next to an egg in a nest just below the surface. Finally, we headed across the Dahna towards the Riyadh airport, stopping only to photograph Lulabelle, a lovely chameleon that posed for us atop a thorn bush. If you want to see animals in the desert, May is the month to do it!